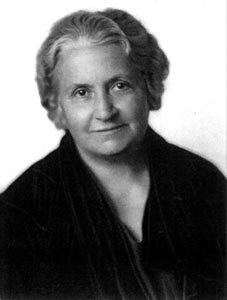 Maria Montessori was born in 1870. Throughout her early years she was very interested in science and engineering. She wanted to become a medical doctor. Because she was a women, the establishment turned her away but she persisted time and again until she gained entry into Medical School. Her initial work was with mentally challenged children in a psychiatric ward. In time, these hospitalised children learned to read and write and her work gained national attention. In 1907, she opened the first Casa de Bambini (Childrens House) in Rome, Italy where slum children were brought in order to remove them from the streets. Her experimental work produced miraculous results with children blossoming far beyond their years into abstract learning through the use of concrete materials. It was a process based on observation of the child followed by the child’s self education in a prepared environment. By the time of her death in 1952, Maria Montessori had developed a comprehensive framework for revolutionising education – quite distant from the mainstream of conventional, governmental education. Her ability to observe and reflect on her observations created a totally new context for the child’s learning. The context for Montessori education is a prepared environment developed on the basis of humanity’s fundamental needs and tendencies. 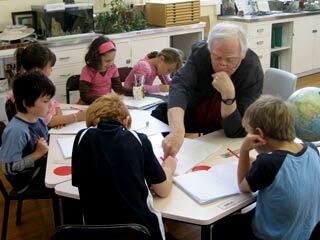 The philosophical foundation of the Montessori approach is based on the premise that education should be an aid to life. Respect for the children’s personality and trust in their inner potentialities are prerequisite to the establishment of a healthy learning ambiance. Today we extend this by asking the children to question deeply what they see. We hope they will be able to explore creative solutions and develop personal integrity so they are ready to meet whatever life may bring. Nova accomplishes this by preparing environments based on the age of the learner, so that individuals from birth to maturity are able to grow and understand themselves and their relationships to each other as well as the natural world. In ‘To Educate the Human Potential’, Maria Montessori proclaims “the fundamental principle in education is the correlation of all subjects.” By cosmic education, she refers to an approach to learning that provides the largest possible context for understanding how everything is related. Through this approach children come to realise humanity’s relationship to the whole. At all levels, Nova teachers emphasise humanity’s responsibility to the Earth community. This is a 21st Century interpretation of Montessori’s call for an education that would bring about a new human being. In a Montessori classroom stimulation for learning comes from the total environment. There is no front of the room, and no teacher’s desk as a focal point of attention. Maria Montessori referred to the teacher;s desk as a focal point of attention. Maria Montessori referred to the teacher as a ‘directress’ because his/her role differs considerably from that of a teacher. She demonstrates the correct use of materials as the children individually choose them. She carefully observes the progress of each child and keeps a detailed record of their work. Each teacher has been trained to recognise individual periods of readiness.